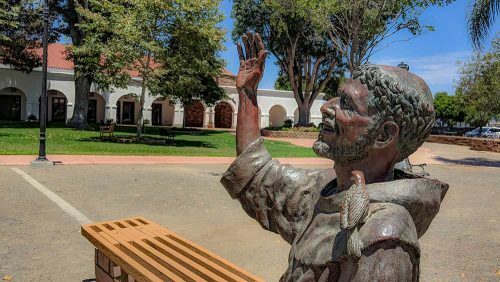 Mission San Luis Rey Parish, in cooperation with the Diocese of San Diego, is committed to maintaining a safe environment for children and young people. As church ministers, volunteers and clergy, we are guided by the policies of the Diocese of San Diego that prohibit sexual misconduct and make clear the procedures for dealing with incidents of sexual misconduct. To report sexual abuse by clergy or church personnel, click here. Religious Education lay persons, ministers, volunteers, parish staff and clergy are screened. They are offered instruction on appropriate professional conduct with students, and are provided information to help recognize and deal with issues of child sexual abuse. The Catholic Diocese of San Diego requires that all volunteers complete Safe Environment Clearance before working with children. Online training, provided through the CMG (Catholic Mutual Group) Connect Program, is a mandatory condition for volunteering in our Catholic schools and religious education programs. To undergo Safe Environment training, contact Elena Zavala, MDiv, Director of Faith formation at 760-547-0715 or Natalie Ibarra, Coordinator of Youth/Young Adult Ministry at 760-547-0702 and then visit: htttps://sandiego.cmgconnect.org.